This year, with Cultivate Kansas City celebrating its 10th anniversary, and Catholic Charities of NE Kansas sharpening its focus on helping families reach self-sufficiency, I’ve been thinking a lot about how New Roots for Refugees — a collaboration of these two organization — has grown since it began more than eight years ago. We started with a small group of women growing in a community garden at Catholic Charities for their friends and families. This year, we have 16 farmers growing on our eight-acre training farm, 10 graduate farmers growing on more than 4.5 acres of owned or leased land across Kansas City, Kan., and more than 60 refugee families growing in three refugee community gardens. 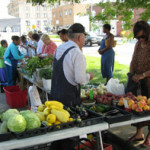 In 2008, New Roots participants sold produce at the Brookside Farmers Market, and the six farmers earned a combined total of more than $12,500. In the six years following, farmers and graduates in the New Roots for Refugees program have sold more than $570,000 worth of fresh, local, sustainably-grown produce to Kansas City residents, many of whom are from low-income immigrant communities. We’ve made such great progress and identified even more potential for growth. We now have three years of New Roots graduates who farm independently, and yet current graduates encounter similar challenges every year. Filing sales taxes and ordering seeds online continue to be difficult, so we’re learning how we can include activities in workshops that will prevent similar struggles for future graduates. Last December, our staff sat down with three graduates who had almost no computer experience, and spent three hours flipping through seed catalogues, talking about plant varieties, and placing orders online. At the end of our taxes workshop in February, farmers used computers and filed their own taxes online, while our staff provided guidance. These adjustments may seem small, but we’re confident that taking the time to make these improvements will lead to even greater success in graduation. While we’re addressing the present with improved program structure, we’re also thinking of the future. One of the things I love about this program is working closely with the same families over four years, getting to know each family and helping to identify strengths in different people. So many of the New Roots farmers have skill sets complementary to farming. Not only did many families in our program farm multiple acres of land in their home countries, but many of them practiced other trades, like food preparation and delivery, and tool and machinery maintenance. With the increase in urban food production happening in Kansas City, particularly in immigrant communities, we’re excited to see how those skills might be put to use in our burgeoning local food economy. We hear from our farmers about their skills and their needs and we’re constantly dreaming about how New Roots for Refugees can help make those dreams a reality. This blog post is part of A Healthy 10.